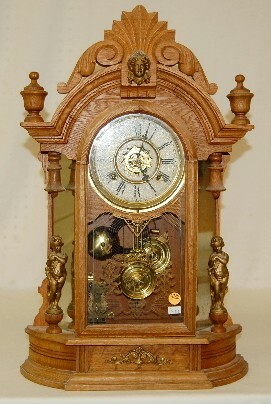 Waterbury Oak "Oxford" Mantel Clock marked Waterbury dial; has pendulum and key; 8 day; T & spring strike with alarm; mirrored sides and metal Cupid statues; gilt decorated door. (Not running; dial crazed; case lightly worn.) 23 1/4"